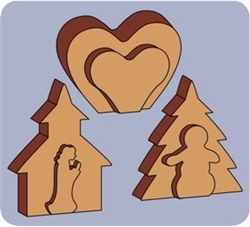 Here are Holiday Scroll Saw Patterns for that Special Someone. Alot More to come! A great addition to any nursery or child’s room! 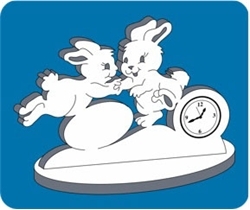 A 1 3/8” clock or photo frame insert adds funtionality. 7” wide. 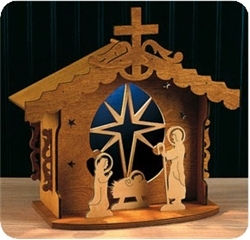 Fantastic gift set to make the beautiful holiday music boxes. 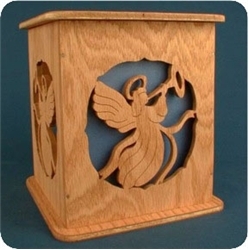 Not just for the holidays - this “heavenly” tissue dispenser is a good reminder year round of our angelic hosts. 6” high. Amaze your sweetheart with this adorable cupid plate. You don’t have to wait until Valentine’s Day to show her cupid struck your heart. 11 1/2” diameter. You’ll enjoy creating this fun holiday project as much as you’ll enjoy using it in your holiday displays. 9” long. 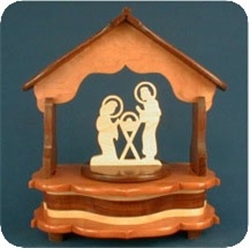 Make this elegant lighted nativity scene that is sure to become a family keepsake for generations to come. Wherever you display it, it will be the focal point of your holiday decor. Approx. 6”D x 13”W x 12 1/2”H. 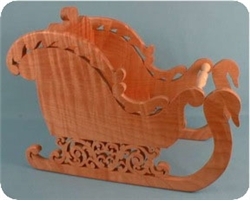 Here’s a festive sleigh project that will be the envy of all who see it! 11” long. Start early and get your craft show ornaments ready! Our snowflake can be stack cut and then simply assembled. 4 1/2” wide. 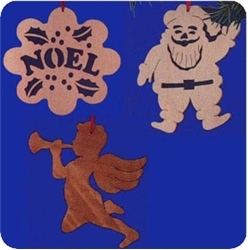 Create your own Christmas keepsakes with these beautiful ornaments. 10 festive designs for all skill levels and all decors. You get TWO Holidays in one Pack with our unique and versatile collapsible baskets. 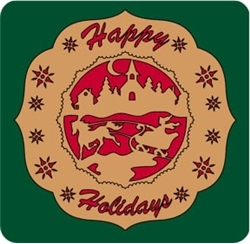 Enjoy the laughter and closeness of young children as you interact with them and our Simple Holiday Puzzles. Each is sized just right for little toddler hands - nearly 5” high! lathe-turned wooden plates! Nearly 12” diameter. set the fans into motion rotating the turntables. Holiday fun! Over 13” tall. to create your own greeting cards and stationery? Our sampler set offers an assortment of opportunities. Use these designs for ornament, letter openers, and book marks for quick and easy projects. Show your mom how much you care by creating a plaque with a restful scene and a message of your love. 5 1/2” wide. 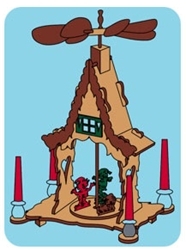 Create a silhouette for the Christmas season with this quick and easy pattern. Reduced in size it creates a beautiful ornament or package adornment. Bring the feel of the season into your holiday decor with our unique photo frame. Add pictures of your family or friends to make a centerpiece that is sure to be a holiday conversation piece. Add music and motion to your holiday decor with this enchanting music box. Our unique design eliminates the need for expensive lathe-turned wooden plates! Instead, you simply use your choice of hardwoods or plywoods to “create” our seasonal Thanksgiving Plate.